If you smoke cigars odds are you already have a humidor. They’re a must-have for every cigar aficionado on the go. While tabletop chests and full-sized walk-ins are great to have, you can’t carry them with you. Like their larger less transportable counterparts, a travel humidor can come in a variety of shapes, sizes, and materials. So how do you know which is the right one for you? Choosing a travel humidor can be like choosing any other kind of humidor. Unlike a tabletop humidor, though, this one will have to be much more compact and able to withstand a lot of movement. Shrinking down a humidor poses some new challenges to keeping your cigars fresh. There’s less room, and there’s less air and you run the risk of your humidifier being too close. You also have to worry about the durability of the material, and whether your cigars are going to get crushed during transport. While picking a travel humidor might seem a little more complicated now, don’t worry. We’ve got a few tips that will help you pick the perfect travel humidor so you can go out and explore in style. You’re not throwing away money on some one-time-use travel accessory. You’re investing in a fully functional humidor. Sure, a travel humidor may seem like a small thing. But, if you pick the right one, you can use it over and over again without fail for years to come. A cheap travel humidor is tempting, and it might even work well — for an entire two weeks. If you do decide to choose a cheaper option, make sure to check reviews beforehand. Especially if you’re buying one online from a retailer like eBay. Don’t forget: if the price seems too good to be true, it almost definitely is. While it is possible to find a travel humidor made out of Spanish cedar, you might want to consider something more durable. It’s impossible to drop your walk-in. But it is entirely possible to drop your travel humidor off a third story balcony and into a fountain. As an example. You want to make sure your humidor will protect your cigars from whatever your adventures will throw at you. Metal, carbon fiber, and even plastic all make excellent options for travel humidor material. 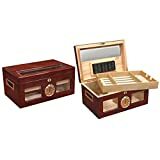 They don’t have that classic look of polished wood, but they’ll keep your cigars safe no matter where you go or how you get there. As with regular stationary humidors, you want to make sure your travel humidor has a strong seal to keep excess moisture out. What metal, carbon fiber, and plastic humidors lack in looks they more than make up for in seal secureness. That said, you’ll still want to check and make sure you get that tell-tale “whoosh” after you open and close it. This is where travel humidors get tricky. Most travel humidors don’t come with an excess of room. That’s the price of portability. There is a good chance your cigars will end up too close and they’ll get soggy. There goes your vacation. One solution to this would be to look for a travel humidor that uses stick humidifiers. This gives you a little more control over the humidifiers location and moisture levels. It is also possible to bypass this problem completely by sticking a piece of cedar wood between the humidifier and your cigars. If you’ve ever flown anywhere you’re probably aware of how well airlines treat your luggage. That’s to say, a lot like a football — no matter what’s inside. The outer material of your travel humidor will do a lot to protect your cigars from the outside world. But it won’t do anything to stop them from flying around inside the case. It’s fine to let your cigars run loose in your tabletop humidor. But when you’re looking at travel humidors you’re going to want to pick one that’s pretty groovy. Fitted grooves or foam cradles are the absolute best way to ensure your cigars stay firmly in place during transport. A ground crew member could punt your suitcase, your cigars aren’t going anywhere. When you’re trying to choose the perfect travel humidor, you need to consider exactly how many cigars you’re going to take with you. By default, travel humidors tend to be on the small side. But if you pick something too small you run the risk of your cigars being too close to the humidifier. If you pick something too large it could prove too difficult to transport and you might as well just stay home. The key is deciding how many cigars you’ll take with you on your average trip. If you’re bringing three to five cigars you can find a stylish travel humidor you could fit into your carry-on. Upwards of ten and you’re going to want to look into a large plastic case with foam cradles. A basic travel humidor will get you pretty far. But there might be a better option for you out there, depending on your personal interests. If you prefer to spend your vacations on a golf course, look into getting a caddy humidor. These can attach to your golf bag, or even your hip, and will keep your cigars fresh while you take on the back nine. 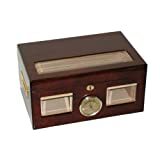 You may also want to consider a vehicle or pocket humidor. These are available at dozens of retailers and could be a better option. It all depends on your personal preferences. Now that you have an idea of how to go about picking out your very own travel humidor, one question still stands. No matter where your travels take you, your new travel humidor will ensure your cigars will be fresh and ready when you get there. Need a little more help figuring out which one to get? Check out a few of our favorite travel humidors. Who knows? You might end up loving it as much as we do.